NRL great Matthew Johns has donned Jordan Rapana and Joey Leilua the best outside backs pairing in the game after inspiring Canberra to a 30-12 win over an ailing Cowboys outfit in Townsville. Speaking on Fox Sports, Johns was compelled to voice his appraisal after the pair linked up for a scintillating try which saw a Rapana put a freakish kick on a dime for Leilua who finished beautifully under the sticks. “As an outside backs combination ‘Leipana’ are the best in the competition,” Johns said on Fox Sports NRL Super Saturday commentary. Both players finished with two tries to each to their names, while it was another impressive performance from Raiders young-gun Charnze Nicoll-Klokstad to see the Canberrans move into the top four. Raiders winger Nick Cotric scored in the first five minutes before Rapana crossed in the next set, courtesy of a dropped ball by North Queensland's Javid Bowen. With three minutes to go in the half, an audacious pass from Nicoll-Klokstad found Rapana who kicked in-field to Leilua. 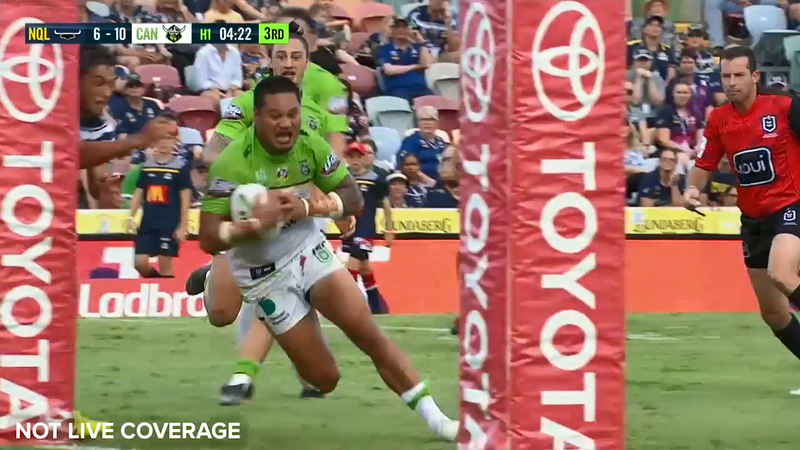 The centre did incredibly well to juggle the ball into his hands for the Raiders' third try of the half.